There will come a point at which Samsung will decide that their flagship smartphone lineup will carry a new name. 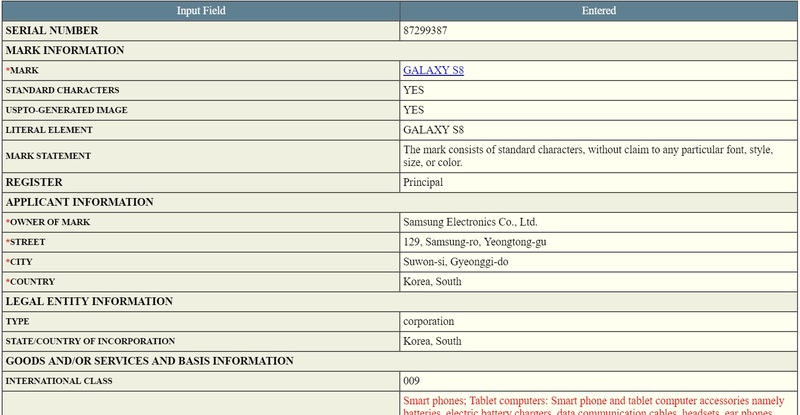 In 2017, however, things will stay comfortably predictable, as indicated by the application for a trademark for the name ‘Galaxy S8‘. Filed late last week, the United Stated Patent and Trademark Office has now published Samsung’s application, which is unsurprisingly intended to be used for a smartphone. Though they have yet to surface, we expect the same application to be filed in other parts of the world soon. Actually, we are more curious to see if a comparable application for ‘Galaxy S8 Plus‘ or even ‘Galaxy S8 edge‘ will be filed, as that would give us more concrete information about the nature of Samsung’s upcoming flagship devices. For now, all we have is confirmation that the next flagship devices will, in fact, come carrying the familiar Galaxy S branding. May be that there is only one phone, with the edge display, called the Galaxy S8. Otherwise they would have trademarked Galaxy S8 edge – which so far they have not.